From an early age I was interested in fishing and joined the school fishing club. We fished from Rame Head, Tubby’s Head and Falmouth Pier. After school, my father, who was also a keen sea angler bought a small boat and we ventured out of Falmouth Bay to catch Mackerel, Wrasse and Pollock. I also remember catching Red Bream off the Manacles and a John Dory off Coverack. 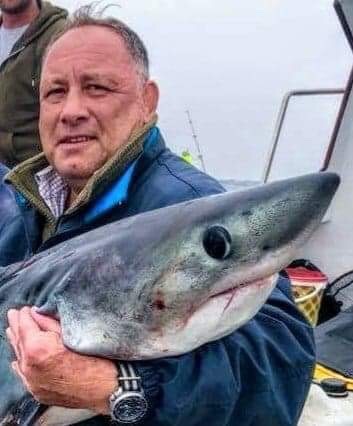 My interest in shark fishing first started when I went a birthday trip on a boat called Monkswood skippered by Frank Vinnacombe. Whist I did not catch anything, we did hook up and the sound of the line leaving the reel at speed, got me hooked. My first shark catch was on Leo 2 from Falmouth some 30 years ago. I have also fished for sharks from, Blue Pointer from Helford, Anglo Dawn from Falmouth and Anquilla from Mevagissey. I never thought about joining the club until recently when I caught a blue and a fellow angler suggested that I should join. We however had no tape measure and only managed to take a picture on a phone. Since joining as an associate member, last year, I have not caught a qualifying fish. My aim therefore is to become a full member. The club has a reputation for being Looe centric so to overcome this we could accept associated satellite clubs within the UK, which would hopefully encourage and promote greater sharking fishing interest. Often when I speak to people about shark fishing, one of the first things I am asked is, ‘do you kill them’? This common mis-conception is something we all need to work on. To promote conservation and best practise we can replace balloon and plastic floats and encourage the use of circle hooks. We should also aim to arrange club equipment discounts. Education promotes conservation and best practise. It also promotes the sport and a starting point for this could be done with school visits and talks. If we can interest people at an early age and engender their curiosity at this early age, it will help to encourage conservation and help to prompt awareness in the shark species. Finally, we must encourage the recording of the catch & release data received from both commercial and recreational fishermen. Working with satellite clubs and using their local contacts would be very helpful in obtaining this data.